In the ongoing Defence Expo 2018, Boeing on April 12 announced a partnership with Hindustan Aeronautics Limited (HAL) and Mahindra Defence Systems (MDS) for manufacturing the F/A-18 Super Hornet in India for its armed forces and pursuing the joint development of future technologies on the lines of Prime Minister Narendra Modi's 'Make in India' initiative. "Boeing is excited to team up with India's only company that manufactures combat fighters, HAL, and India's only company that manufactures small commercial airplanes, Mahindra. This partnership brings the best of Indian public and private enterprises together in partnership with the world's largest aerospace company, Boeing, to accelerate a contemporary 21st century ecosystem for aerospace & defence manufacturing in India," said president, Boeing India, Pratyush Kumar. "Our partnership with HAL and Mahindra will enable us to optimize the full potential of India's public and private sector to deliver next-generation F/A-18 fighter capabilities. Together we can deliver an affordable, combat-proven fighter platform for India, while adding growth momentum to the Indian aerospace ecosystem with manufacturing, skill development, innovation and engineering and job creation," added Kumar. 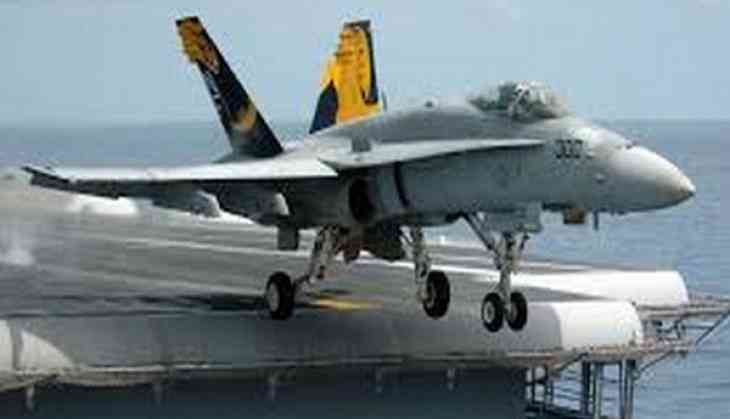 The Super Hornet Make in India proposal is to build an entirely new and state-of-the-art production facility that can be utilized for other budding programs like India's Advanced Medium Combat Aircraft (AMCA) program. "Hindustan Aeronautics Limited has always been at the forefront of aerospace development in India's aerospace sector," said chairman and managing director, Hindustan Aeronautics Limited, T Suvarna Raju. Boeing's future production with Indian partners will maximize indigenous content produce the F/A-18 to create a modern aerospace ecosystem for India. "We are excited about the opportunities that this partnership with Boeing and HAL will provide for us to contribute further to 'Make in India' for defence," said Group President, Aerospace & Defence, Mahindra Group, and Chairman, Mahindra Defence Systems, S. P. Shukla. This partnership is intended to bring Boeing, HAL and MDS' global scale and supply chain, its best-in-industry precision manufacturing processes, as well as the unrivaled experience designing and optimizing aerospace production facilities to both expand India's aerospace ecosystem and help realize the Make in India vision. "As one of the largest private sector defence companies, we look forward to supporting the modernization effort of our armed forces and achieving economies of scale in the aerospace and defence sector," added Shukla. The plan also addresses the infrastructure, personnel training, and operational tools and techniques required to produce a next gen fighter aircraft right here in India. In addition, Boeing will work closely with India industry to ensure they have the very latest technologies, applying lessons learned from the current Super Hornet production line. As one of the most advanced and least expensive aircraft per flight hour of its kind, the F/A-18 Super Hornet will be India's answer for a carrier and land based multi-role fighter. The Super Hornet has a low acquisition cost and also costs less per flight hour to operate than any other tactical aircraft in U.S. forces inventory. And with a plan for constant innovation, the F/A-18 Super Hornet will outpace threats, bolster defence capabilities and make India stronger for decades to come. The F/A-18 Super Hornet has a long life ahead, with the US Navy making significant investments in the latest evolution, the Block III. Key features of the U.S. Navy Block III Super Hornet include enhanced network capability, longer range and low-drag with conformal fuel tanks, long-range detection with Infrared Search and Track, enhanced situational awareness with a new Advanced Cockpit System, improved signature reduction and a 9,000+ hour life. Panama Papers revelation: do Indian laws have enough teeth to deal with it? READ NEXT >> IPL 2018, KXIP vs RCB: Will Kohli's men be able to register their first win of the tournament!